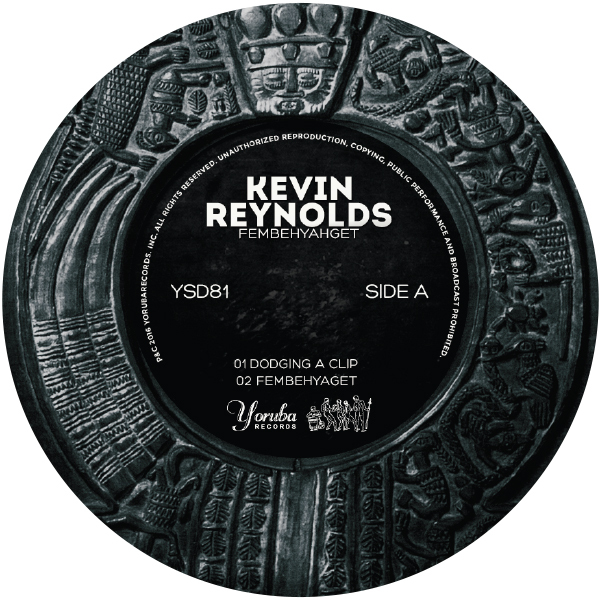 Yoruba Records is proud to welcome Kevin Reynolds to the family with his latest release ‘Fembehyahget’. A student of Detroit’s early underground techno scene, Kevin delivers a line-up of transcontinental sound rhythms through the lens of this seasoned producer. Kevin’s finely tuned engineer ear and his masterful DJ touch come together to offer listeners an exploratory journey from the mind of a student of all genres of music. The first track, ‘Dodging a Clip’, is reminiscent of NYC break-beat loops, with a signature Kraftwerk robotic soul, a combination that points to Reynold’s Midwest education where German electronic music, Motown soul, and Chicago house contributed to the sound fabric of the 1980s and 1990s Detroit. Up next is title track ‘Fembehyahget’, a monstrous tune that pulls us in deep with a soul clap scattered strategically throughout the song. Its electro acoustic sound is accentuated by samples of traditional African vocalists and the call and response nature of her accompanying choir. ‘Travelled’ is a down-tempo jam with brilliantly placed Bossa Nova vocals. Hints of new wave synths hold the track in place and help it to transcend time. Finally we close out with ‘Vibe Samba’, an infectious syncopated jam that leaves plenty of space between the beats for imagination on the dance floor. This EP delivers quality compositions that push up against any and all notions of musical borders, and we hope you enjoy listening to it as much as we have bringing it to you.